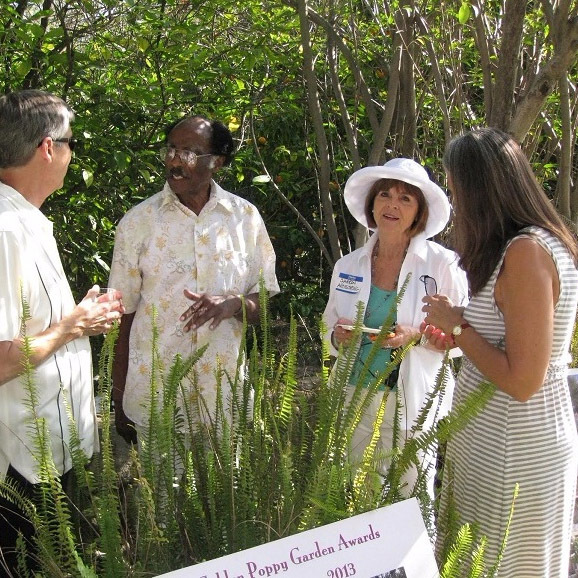 About 110 people attended the 11th annual Golden Poppy Awards and Garden Celebration on the Old California style grounds of Ed Ellis’s home by Millard Canyon. Altadena Heritage served a groaning board of sandwiches, snacks, curry, and desserts. Mark Jilg of Craftsman Brewing Company graciously sponsored and poured his famous handcrafted Poppyfields Ale. Board member Gail Casburn presided over a selection of delicious French wines from her Altadena Wine and Ale House. Bill Ellinger gave a brief talk on the history of Mr. Ellis’s property, Casa Roca, built in 1905 by bicycle visionary Horace Dobbins, and visited by famous aviatrix Pancho Barnes, a family member of his.